There's a story behind every piece of art and at times the artist is aware of it and at times they are not. Some painters even start painting without knowing what they are painting and the story behind their piece unfolds as they paint.It took a while for me to realize why I draw what I draw. I draw portraits of people who inspire and challenge me to be a better version of myself. The story and meaning behind the pieces of other artists go even deeper . June did accounting in uni so she is good with numbers. 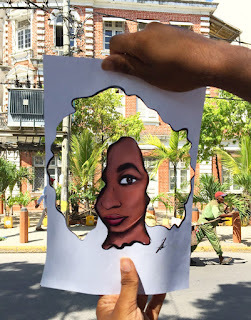 What fascinated me even more about her is the fact that she had never stepped inside an art class, that she learnt how to draw on her own and that she drew the digital art piece above from an app on her phone. Have you seen the detail on that piece Amazing! She told me a little about the reason why she worked on the piece above. Well apart from the fact that she needed to create a piece for the MASK competition. She was also trying to depict her life. 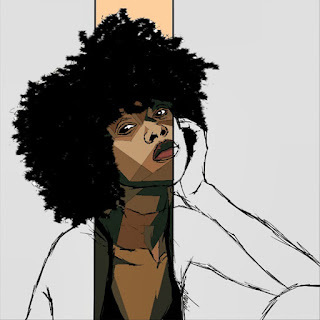 The pixellated sections indicating the fact that she is taking life a piece at a time. The piece incomplete because she is still living and as long as she is living she will continue filling the missing pieces of the puzzle. This year's MASK Award Ceremony was held at the Micheal Joseph Center on the 27th of April. 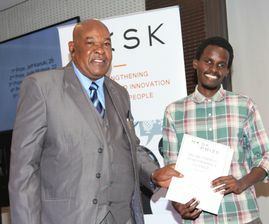 The image above shows Edwin Wainaina, the first prize winner of the Visual Arts under 25 category receiving his gift from David Kimathi the Managing Director of Mabati Rolling Mills. Alla Tkachuk the founder of MASK in the background looking proud of Edwin. Edwin has participated and won prizes almost every year since the inception of the Award ceremony 5 years ago. I wrote about his work from a previous MASK award ceremony here. 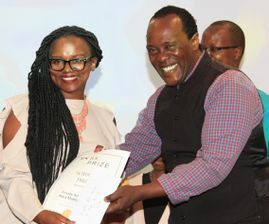 Jeff Koinange was invited to award some of the winners and it was nice to find out how passionately he supports the arts. He encouraged the artists present to continue doing what they love and putting their best because it will lead to big and better days. He gave a good example of an artist who kept at his craft and later succeeded immensely. The artist was Vincent Van Gogh who is said to have sold one piece in his lifetime before he died at 39. He had done more than 900 pieces and the piece he sold now resides in Pushkin Museum in Moscow. His other pieces are still selling even after his death and in 2015 one of his pieces was sold at $66.3 million. He ranks top along with famous artists such as Pablo Picasso and Andy Warhol having sold the most expensive pieces. Mary Muringi's story is an interesting one. She loves art and children so much that she decided to start a private art studio for kids from different schools. One of her student's was awarded for doing an awesome piece. It was very heart warming to watch as well as listen to how the parents to her student were supportive to their son. The mother of the student, told the audience that they would take their son for football sessions. However, when they noticed he was not interested they decided to enroll him for Mary's classes and the rest as they say is history. They were so proud of their son and were right there on the stage with him when he went to receive his award. The whole experience gave me and I believe many other people in the audience hope. Hope because it is our environment along with the people in it that nurtures or cripples creativity.If relatives are supportive of the creatives among them then there will be more room for creativity and innovation. Mr. Majani representing the Permanent secretary (PS) of Education awards Jeff Kariuki in the Music/Video Category. 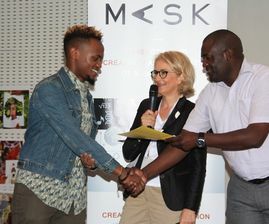 It is important to note that MASK awards all forms of artists and it does not restrict itself to one form of art only. Jeff Kariuki does animations.One of the winners in the music category Patrick was even given a chance to perform his song as the award ceremony drew to a close. In support for another creative in my family.I will leave you with the following video. It is a project my sister did for her Journalism class. It is about art as a business in Kenya, I appear somewhere too. In the spirit of supporting the arts please give it a thumbs up, subscribe or leave a comment. Also feel free to visit the MASK website to see more on the other winning pieces. Thank you again Alla for the invitation.Until next time kwaheri. 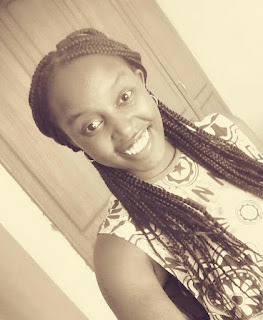 Dear Wendi, the MASK Prize is hoping to ignite and celebrate creativity of such young people like you. Thank you for telling the stories of our winners! See you next year! Alla, Director of the MASK Prize. Your welcome Alla, It's always a pleasure writing about inspiring young artists and I hope that their stories will inspire other young artists out there. Thank you for your invitation and I look forward to coming for the next one. See you next year!